The Sittin' Hawaiian | American McCarver. Your Sports Blog. The result of that big fight between the Giants and the Phillies? 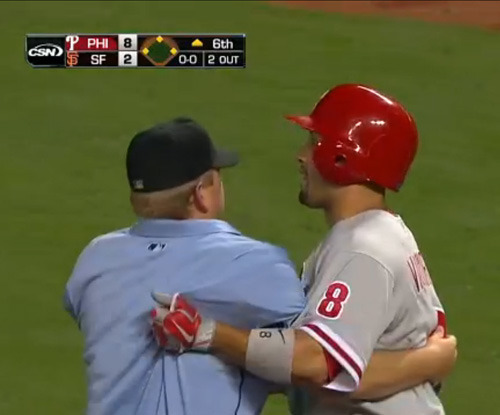 It’s a three-game suspension for Shane Victorino! The Flyin’ Hawaiian walked toward the mound after being hit by a pitch, then later wrestled with umpire Mike Muchlinski. I’m guessing that rasslin’ with a man in blue is not appreciated by the powers that be. Not suspended: Ramon Ramirez, who hit Victorino with the pitch; Eli Whiteside, who stepped between Victorino and Ramirez; and Placido Polanco, who ran in from second base to throw gasoline on the fire.